I am amazed and saddened to hear of riders still screwing around in squalls despite all the needless avoidable accidents and fatalities over the years. Every year riders kill themselves in squalls and yet people keep stepping up for their own turn. It is guaranteed that a percentage of riders going out in storms will be injured, just not all of them, volunteers? 1. I can handle it. Not if it boosts to 60 to 70 mph, particularly if your flat kite malfunctions (it happens). Many riders have been killed in far less, around 40 to 45 mph and even less than that. 2. I'll just hit the quick release or emergency depower if I'm hit by a violent gust. People in severe accidents almost NEVER do this successfully, over and over again. Lack of practice, can't find it in time, there is NO time to react (quite common) ONCE the gust is on you, you simply freeze an allow precious seconds to act slip away, the mechanism doesn't work as planned. By far the best course is to AVOID the violent weather. Once it is upon you the outcome is highly uncertain, over and over again. 3. If I'm far enough away from land, I'll be OK, regardless of the gusts. 4. You can't avoid violent gusts, if it's blowing, I'm going. Wrong and delusional at the same time. There are lots of EASY things riders can do to avoid violent weather particularly with all the excellent weather resources in the USA. What sort of chump just grabs any old kite and tries to go? 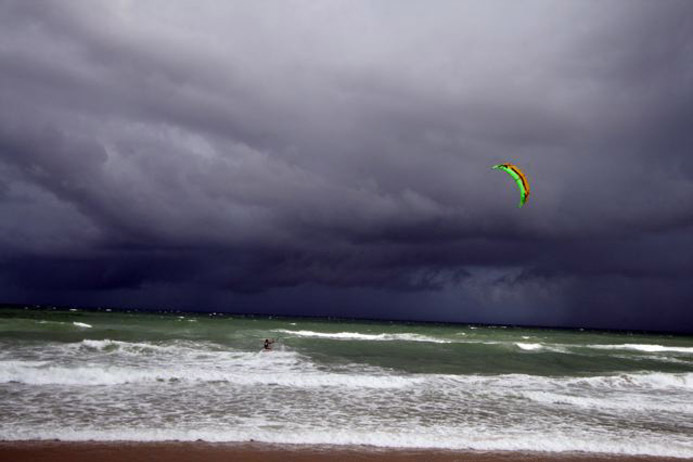 You try to pick the best kite for the conditions, right? Knowledge and experience count, same applies to weather planning and monitoring. What's more, you can often see violent weather before it arrives if you bother to even look. So many never troubled themselves, while they had the option. 5. You can tell how bad the wind will be from a cloud by looking at it. Sometimes yes and sometimes no, it is highly unreliable. One thing you almost NEVER know is how strong the winds will be that come with the squall. The wind may die entirely or just diminish, it may stay the same and even shift offshore or it may boost to 30 to 40 to 50 to 60 mph + likely with insufficient time to do anything about it once it gusts. There are lots more myths and misconceptions out there. Last edited by RickI; 10-01-2007 at 12:52 PM. A nasty looking Shelf Cloud in Brasil. Some dark, heavy weather moving in Holland? A pretty white fluffy cloud likely containing a supercell(s) with the capacity to throw out microbursts, tornados and high, violent wind gusts off Boca Raton, FL, USA. LOTS of other variations out there, we are talking about an entire WORLD of weather, right? Get to know what goes on in your area. So, what is the problem? Good useable winds, perhaps even on the lighter side, rigged big - right and suddenly, KA-POW, a very strong gust slams in! Say 15 kts. to 40 kts. or even 10 kts. to 50 kts. This can happen in many areas of the world. The force exerted by your kite can increase by SEVEN TO TWENTY-FIVE TIMES IN THESE GUST RANGES!!! Serious stuff, more power than we can safetly handle. If something like this hits and you have a kite up it is UNCERTAIN how things will play out. You might be able to depower your kite and keep it. Your kite might be ripped away from you and threaten someone else downwind or simply get trashed on a powerline or building. Or, you might not be able to depower or unhook, LOTS HAVEN'T BEEN ABLE TO, and you are going for a ride. Possibly lofted high, long and fast or dragged, short, fast and hard. Either way, serious injury may happen and has already happened to other riders. So how about an example? Take the storm system, nice white clouds, pretty almost. We had some of these moving down the coast here over the last two days. Note the multicolored cells in the storm band to the north. The reds and darker colors indicate POWERFUL storm cells. The kind that can toss out gusts on the order of 35 to 50 kts. or even higher, in tornados that could be spawned. Time to rig up and go? Not if you aren't running for a Darwin Award. So, how do you try to deal with squalls and ride hard, fast and well into the future? 2. Check realtime wind reports both locally and upweather. If there are strong gust spikes and/or sudden direction changes examine the radar particularly for that area. Cold fronts are often preceded by squall lines with a narrow band of violent weather. This is often easy to see and avoid. See if there are severe weather warnings, if there are pay attention. 3. DECIDE, if based upon this and PAST experience with similar systems if something nasty is likely to slam down on you or not. Ask other people in your area, windsurfers, sailors and tuned in kiteboarders for example. Make it a point to learn about weather in your area, good sessions and bad will ride on this. 4. If you decide to go, STAY AWARE, at all times of the weather. Things like cloud lines, wind direction and velocity, white caps, temperature changes. Good chance you are a wind junkie already so play the complete roll and tune into wx. No one session is worth your life or even a nasty injury, when in doubt, blow off the session. There will be lots more in the future. 5. If you see a squall moving in, get to shore well IN ADVANCE of any change in wind speed, direction or temperature. Anchor your kite very well and detach the lines. Runaway kites can do harm to those downwind. Guys have already been severely injured by waiting too late in this. Lets try to cut down on repititons of these avoidable accidents. 6. If you ride with a bunch of regulars at your local launch consider getting an airhorn(s) and agreeing on a SQUALL'S ON - ALL IN signal. Something like three fast blasts repeated. Some also hoist a red flag at times like this. Try to look after your own in this, the squall doesn't discriminate and will spank anyone that is in the way. 7. Regularly practice emergency depowering. Be sure to preflight and properly maintain your gear. Wearing reasonable safety gear is a no brainer, if you want to improve your odds should things go south. So many never bother. Last edited by RickI; 09-30-2007 at 09:11 AM. - Was the hazard fairly obvious and avoidable? - Did you disregard the hazard and possible consequences? - Did you use "due care" to warn your students and try to avoid the evident hazard? It is possible that civil and maybe even criminal charges could follow. Look at what the boat Captain is going through in Pompano after the para sailing accident in the squall. He was facing criminal charges and a civil lawsuit. Add to that what he will likely be thinking about for much of the rest of his life. If you don't teach, you don't have to worry about any of these serious consequences in ignoring storms, right? Wrong. The hazard is obvious as are the possible range of consequences. Some call us "dopes on ropes." If all riders, not just instructors use common sense and courtesy it should be easy avoid that handle and a lot of possible problems. Think about it. * In kiting "freak accidents" are fairly uncommon. Most are predictable and avoidable with reasonable due care. Last edited by RickI; 10-01-2007 at 07:41 AM. Once you take someone under instruction you then assume responsibility for there conditions and safety if under contract or money. So you have people out in crazy stuff, you can get them hurt and be in alot of trouble, states in insurance guidelines that you have to stop instruction if hazardous weather is in the area........oh yeah in case you think your smart , they just look at radar. more knowledge less, risk......but there will always be risk, lets not kid our selfs, the more you push the envelope the more it pushes back! p.s. dont be afraid to tell the other guy, man this is not a good looking front coming in, better not go out...if we speak up more, maybe we can has less problems......even the instructors need to be told this from what i have seen. Having a top instructor emphasize these ideas helps tremendously. I once spent a gusty day on the beach watching kiteboarders getting yarded, and I began trying to conceptualize the psyche of the rider that willingly goes out in conditions that are catastrophic. I think guys that ride in squalls may fall into three areas. The first and apparently most common is comprised of people that really aren't aware of just how dangerous these storms can be. I encounter this fairly often. The second involves riders who may be more aware of the hazard but blow off the risk denying that harm will ever come to them, because ... not sure why. It is a numbers game, lots of people can do ill advised things and only a percentage will get spanked or worse, killed. The last involves riders who should know the hazard, may have been injured already in excessively gusty weather, who try to use technique as a counter. Compared to the first group, they are way ahead, as well as compared to the second group too. Then again, gear fails, particularly under peak loading such as in storms. If your timing is off, or if the storm misses some key cue, then what? Also, just how much can you do if a 60 kt. plus gust is served up say from 20 kts.? When, it comes to squalls, BIG holes or areas of clear air beyond the disturbance are worth looking for. Once the storm and poor conditions start to move in, the smart money packs it in, early. Just like golfing in a lightning storm, you won't necessarily be struck, the odds just go way up. Heavy weather's moving in, anyone for the links? Tom Leeman supplied some nice shots of some inbound squalls last Saturday afternoon. I had an incredible session that morning and had called it a day when the first small squall started to move in. Squalls seemed to head through a frequent intervals for the rest of the afternoon judging from torrential downpours a bit south in Boca Raton. Tom Leeman shot the rest of these as well. 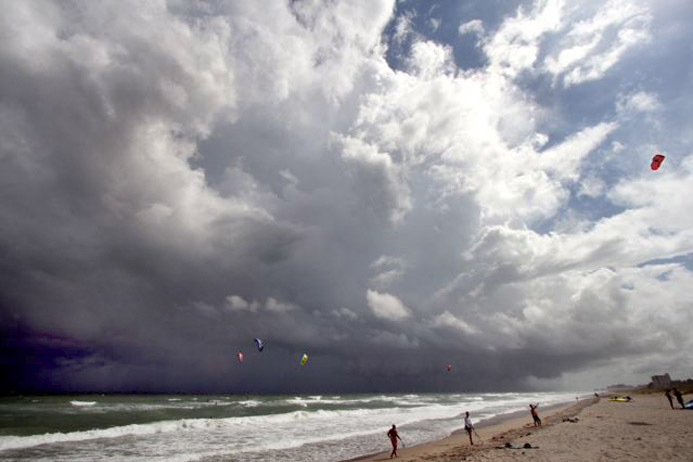 As a rule, in recent times, I've noticed the guys in Delray usually come in before squalls are on them. It is hard to judge distance in these shots but it seems likely the squall was close enough for a nasty gust front to slash out and of course they're are well within lightning range. Not sure what happened this day but no one was hurt or lost their boards that I heard about. I know after one of the early squalls the wind died off for about 1/2 hour in the post-storm. and you never really know which of the above will happen in advance. Lots of guys have been killed and maimed worldwide over the years. Use your head to try avoid pain or use it as a projectile. Squalls don't care what you do, they just act. Last edited by RickI; 10-09-2007 at 10:49 AM. There have been two fatalities in the last week involving experienced kiters in very high, gusty winds. 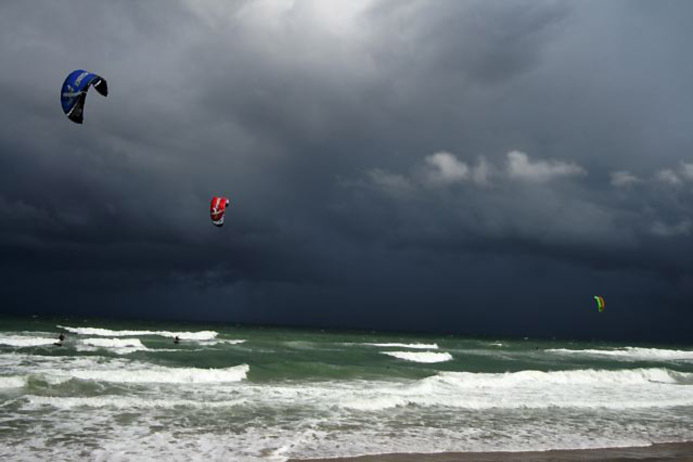 Experienced riders had decided to sit out the session but not all kiters made this choice. It is easy to be lulled into denying what can go wrong in seconds during an powerful gust. The sense of adventure putting things on the edge and ripping loose can captivate many of us. We need to checkout the weather, listen to our gut and if appropriate sit this one out. No session is worth the rest of your life. More powerful winds are likely to come through with fronts. We traditionally have had a number of losses in the fall. Think about it before heading out.